To adjust the headlight beam level according to the number of the passengers and the loading weight in the luggage area, turn the beam leveling switch. 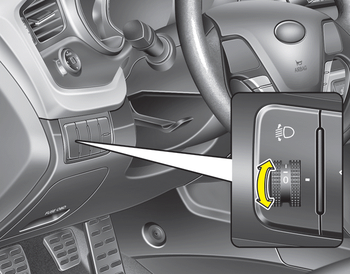 The higher the number of the switch is positioned, the lower the headlight beam level. Always keep the headlight beam at the proper leveling position, or headlights may dazzle other road users. Listed below are the examples of proper switch settings. 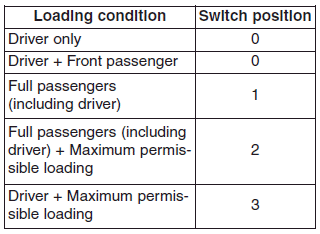 For loading conditions other than those listed below, adjust the switch position so that the beam level may be the nearest as the condition obtained according to the list.